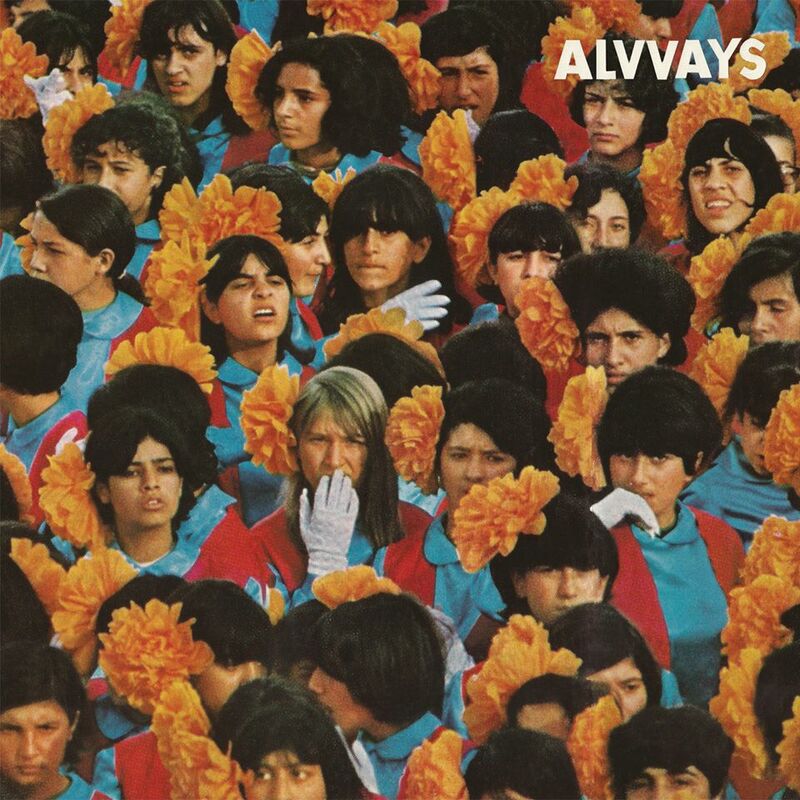 One of our best musical discoveries late (past imperfect) in 2014 was Toronto’s Alvvays. The band’s jangle-fuzz delivery, coupled with the compelling vocals and lyrical acumen of Molly Rankin, left them ranking high on our Best New Artists of 2014 list (thereby supplanting prior new jangle-fave, Allo Darlin’). To get a feel for Alvvays, check out their superb set on the reliable KEXP, all as recorded in their studio in the early days of December. Check out the four-song setlist below and listen to the entire performance. Superb stuff! Got the post-Christmas/pre-New Year blues? Need to get away from grandma, uncle or that pesky little kid/grandkid? We’ve got just the thing for you. Tomorrow night Santa Barbara will be the beneficiaries of both Cracker and Camper Van Beethoven performing at the Lobero Theatre. Undoubtedly, Cracker will concentrate on songs from their fine new double-album Berkeley to Bakersfield. When Camper Van Beethoven called it quits in 1990, the seminal American indie-rock band Cracker rose from those campfire ashes, formed by singer-songwriter David Lowery and gifted guitarist-songrwriter Johnny Hickman. Cracker went on to release carefully-crafted and much-loved songs Teen Angst (What the World Needs Now), Low, Get Off This, I Hate My Generation, and Kerosene Hat amongst a score of top-quality compositions and albums (to this day, The Golden Age remain two of our all-time favorites). Over the course of their still-fecund career, Lowery and Hickman have delivered some of the most well-wrought lyrics and melodies of their generation and have gone on to release ten studio albums and various other superb solo albums and other varietals. Despite their superb discography, they’ve never let down and this month released an ambitious ode to the music of California, with the outstanding double-album Berkeley to Bakersfield (TLR–another reason to not release those Best of 2014 lists too early). The Berkeley album features the rockier sounds of California, while Bakersfield harkens to the country-roots side of the California sound continuum. It is an outstanding release that is garnering critical acclaim around the globe. 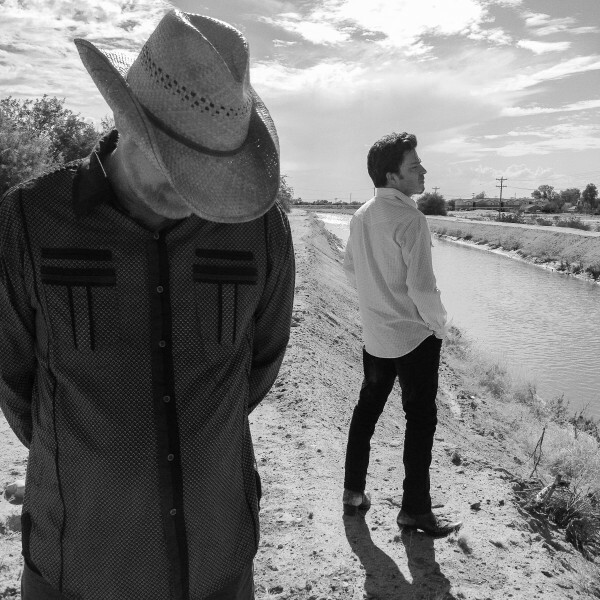 Check out a few of the gems (Almond Grove and California Country Boy) off the album below. The bottom line: do yourselves a favor and get out to the Lobero Theater tomorrow night in your own backyard and check out one of America’s great bands. You can still get tickets HERE. It’s coming on Christmas and the “Happy” Holidays, and apparently The National and Bob’s Burgers are taking a break from all the “happiness.” We’re breaking our no-new-Christmas-songs-rule and passing along below a vignette from a Bob’s Burgers episode in which The National sing a little Christmas ditty (Christmas Magic) about others experiencing hard times. Sympathy during the season. Huh, who knew? 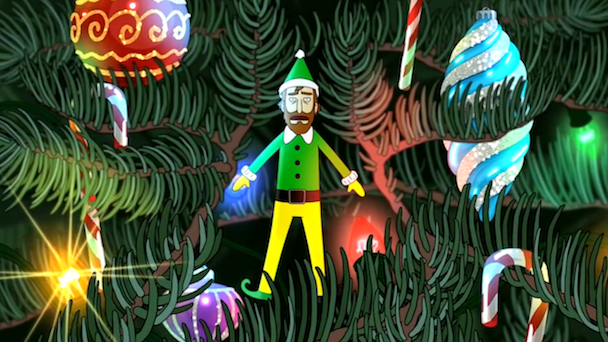 We like everything about the song and video (featuring a gratuitous depiction of Matt Berninger as a bearded Christmas ornament elf), including the mandolin and closing wailing vocals. Keep being kind out there people. Year-round. The jury’s still out as of now for our Best Concert of 2014. But right at or very near the top will be The National’s rain-catharsis show at The Santa Barbara Bowl in late April. Despite our drought-addled environment, rain suddenly fell that night, and it felt like a sing and show from above. As we wrote: “while the band was sailing along during their set, the skies opened up (especially the downpour during Slow Show and amidst the oh-so-apropos England) and righteously baptized the proceedings.” They are simply America’s (if not the world’s) best live band. 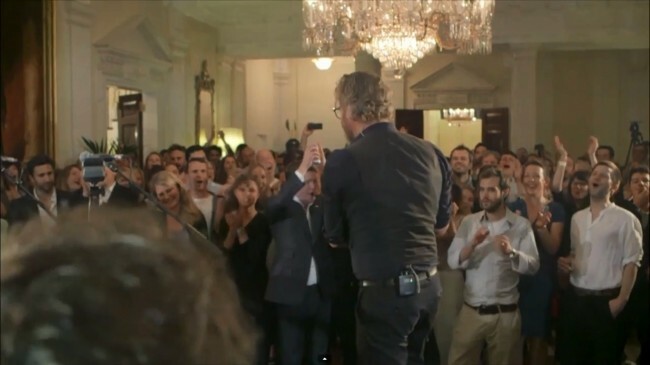 We’ve just discovered that the folks at the US Embassy in London began the Winfield House Sessions this year “to tap the special diplomatic power of live music, which can dispel differences and stir our sense of humanity’s common ground.” Check out the majestic performance below of the epic England at the Embassy below. The video begins with the introduction of the band by US Ambassador Matthew Berzun as his “favorite.” We’ve got that in common Mr. Ambassador. 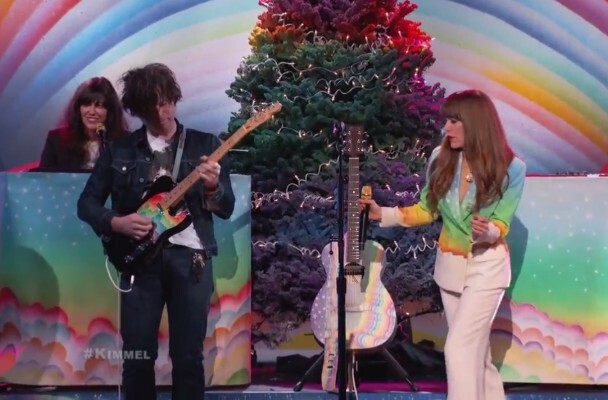 Colbert wrapped up his Report last night with a massive, star-studded singalong, and the Foo Fighters took over Letterman, so it would have been easy to miss the great Jenny Lewis backed by pal Ryan Adams on Jimmy Kimmel Live. Adams co-produced Lewis’s pop-masterpiece, The Voyager, which will appear high up on our list of the Best Albums of 2014. Adams has recently joined Lewis for some dates on her tour (and on Wednesday at Adams’ concert at the Wiltern he covered She’s Not Me and had Lewis join him on Oh My Sweet Carolina and Come Pick Me Up). See the latter at bottom–beauty right there. Check out below the two sterling performances of She’s Not Me and Just One of The Guys below by Lewis and ensemble. Lewis is in fine vocal form, her band is in sync and Adams has some nice guitar flourishes to lend (particularly on the former). By the way, can we all finally agree that those inflatable balls have got to be banned from concerts? Are you there to get lost in the music or pretend you are seven years old and its your birthday party? Please, no mas. Check out the building, inspirational song below in which electric guitar is pushed to the fore and Marling lays out her personal take on our (comparatively) short sequences here. 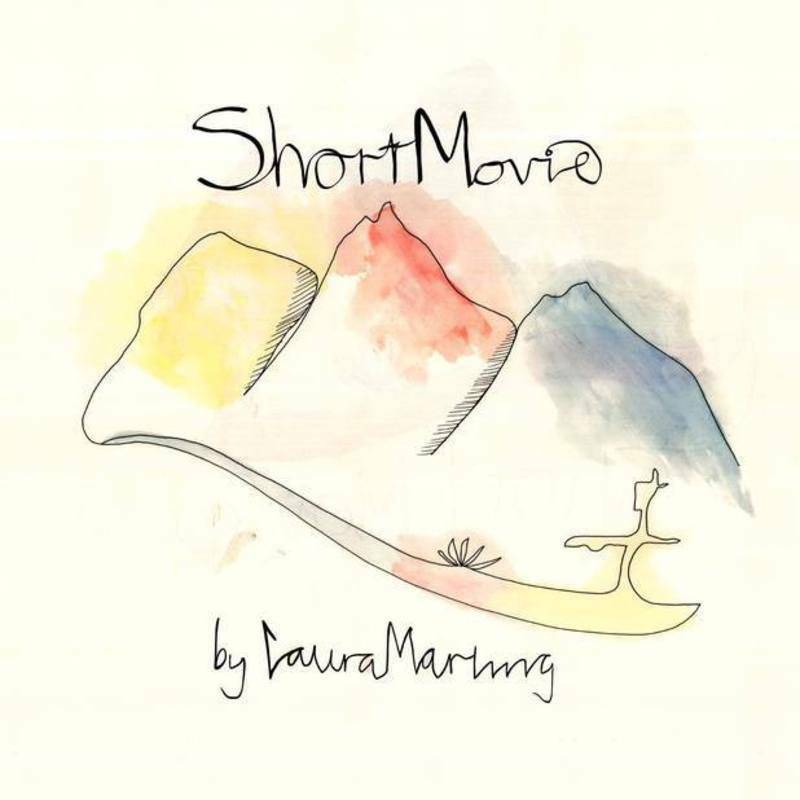 The animated video draws you in and gives graphic aid to the song’s lyrics (see below the video). We especially like her tremendous tremolo-vocal flourishes at and after 3:21 in the song that harken back to the great Joni Mitchell. Come on, what’s it about? 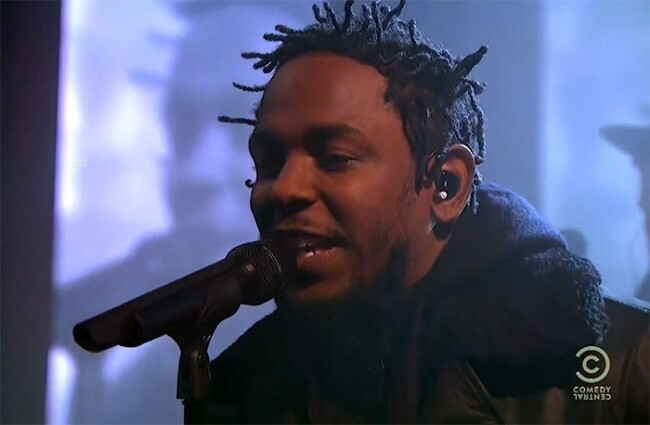 Last night Kendrick Lamar closed down The Colbert Report (as the last musical guest) by introducing a scintillating new, unnamed song. As usual, Lamar simply lit up the stage. The new song has it all. Riffing on the advice forced on him/us by seemingly everyone on the planet (agents, Indians, neighbors, you name ’em), the song begins spoken-word and segues through jazz-inflected flourishes of flute and saxophone while accelerating to a stunning finish. Watch as Thundercat (Flying Lotus) supports on bass (with a crazy head-thingy), Bilal and Anna Wise backing on vocals and Terrence Martin delivers on sax, along with a cast of awesome. No one does it better. And of course Colbert opens with his usual hilarious interview/speech of the artist. Now THAT’S entertainment! Watch the performance followed by the interview below. We’re currently reconnoitering and conjuring and divining our annual Best of 2014 lists for publication at year’s end. We remain firm in our belief that publishing those lists before year-end does a disservice to those artists releasing music in December. And truth has been borne out: at the risk of slighting Elbow, The War On Drugs, Spoon and Sharon Van Etten, we will likely make Nicki Minaj’s just-released album our Best Album of 2014. Sorry, just checking to see if you’re still reading. That’s officially sarcasm, people. It is highly unlikely that Ms. Minaj will ever receive praise on The Lefort Report. What the world needs now is Anaconda? Jeesh. Sorry, got sidetracked there. 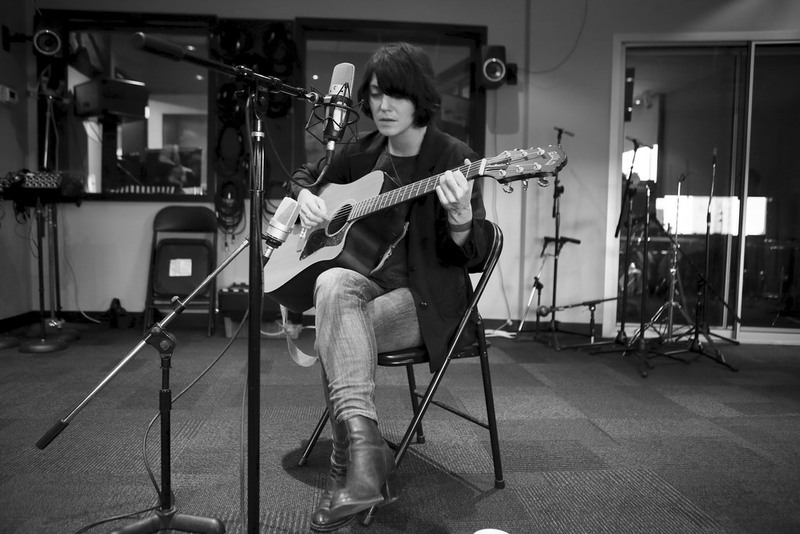 In comparison, Sharon Van Etten is one artist whose 2014 album and songs deserve to be at the very top of the Best of 2014 lists. We don’t know of an album released this year that cut as deeply into our hearts and ears as SVE’s Are We There. It’s her best album to date (self-produced too) and simply magnificent from stem to stern. We love everything about it, including how perfectly it soundtracked a memorable train-ride across France last summer. One of the more difficult tasks ahead of us is attempting to pick amongst all the deserving songs on Are We There for our Best Songs of 2014 list. Amongst the possibles are Afraid of Nothing and Tarifa. Both songs are wee-small-hours evocative and weighty in their separate ways, and the recorded versions are unassailable. Thanks to KDHX we now have stunningly-great, unplugged performances of the two songs, which you can watch below. We had not heard Van Etten perform unplugged recently and were (once again) taken aback by her stirring and incisive tremolo-falsetto (especially on Afraid of Nothing). No vocoder. No adornment. No anaconda. Just art distilled to its essence. There have been some obvious voids in the music world that are now being filled. First was Jamie T.’s outstanding comeback (Carry On The Grudge) after a four-year hiatus. 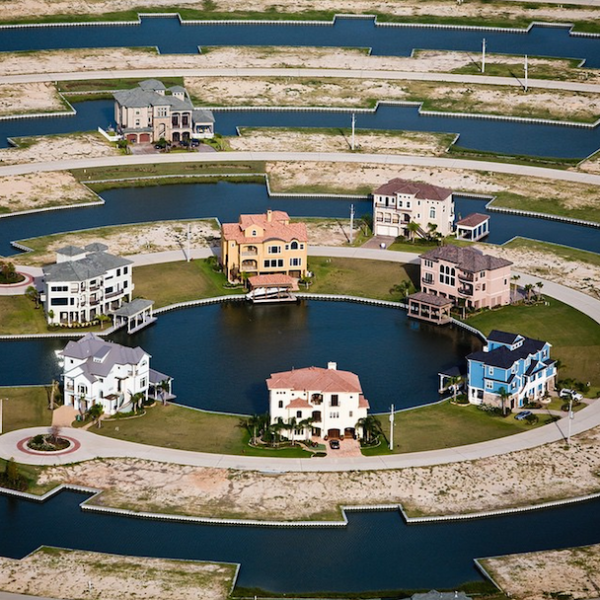 We now have news that Modest Mouse will release their first album since 2007 when they release Strangers to Ourselves on March 3rd (via Epic Records). Today Modest Mouse released the first single from the new album, Lampshades on Fire. You can check it out below. Speaking of Jamie T., while Lampshades on Fire harkens back to great Modest Mouse songs of yore, we hadn’t previously drawn the (now-obvious) comparison to Jamie T., but we hear it in spades on Lampshades on Fire. Come to think of it, a tour in 2015 combining Modest Mouse and Jamie T. would be a fantastic gift to the music world, and would garner Jamie T. some much-needed, much-deserved attention in the United States. What say you fellas? Lampshades on Fire is on sale now at the usual outlets. Lampshades on Fire will be made available as an instant download to those who pre-order Strangers to Ourselves on iTunes or Amazon. You may be leaving for an airport soon. This Sunday or another day soon. To help put matters in perspective, check out Aussie/Brooklyn duo Luluc’s song/video Small Window below. Luluc (Zoë Randell and Steve Hassett) has been picking up Best of 2014 accolades from around the globe for its Aaron Dessner-produced album Passerby (on SubPop) and the songs thereon, and not least for Small Window (lyrics at very bottom). Check it out below in all its melancholy, pastoral beauty. Comparisons to the underrated Kate Wolf are not incorrect, along with Iron & Wine (an original SubPop find), Hem and Claudia Schmidt. We love Dessner’s (standard) deft production on the album (check out the horns on Tangled Heart below). After Small Windows check out the recently released official video for song Tangled Heart followed by their Tiny Desk Concert on NPR.